Many blogs and large traffic sites rely on advertising as their primary source of income. This might include Google AdSense, Affiliate Ads, or Direct Ad sales. The one problem that many encounter is that advertising is a monetization strategy that’s hard to maintain and difficult to manage. Fiddling with your AdSense code and your WordPress theme can quickly become a nightmare for many. And have you ever tried keeping track of the banners you sell on your website? Fortunately, you can easily fix these problems if you set up a professional ad management plugin on your WordPress site. And don’t forget to optimize your ads for mobile. According to a study by WordStream, mobile ads have a 40% higher CTR than desktop ads. Here’s a detailed comparison of the 6 best WordPress advertising plugins that can help you boost your blog revenue by providing an all-around better ad management solution. If you are looking for a solid and well-developed WordPress advertising plugin, we highly recommend starting with Ad Inserter. It currently has 40,000+ active installs with 4.9 out of 5-star rating. This is probably one of the most well-maintained plugins on the repository and the developer, Igor, is very active in the support forums. One great thing about this plugin is that it lets you insert ads at any point in your post. You can do it before/after the post content, or even by a % of the way down your content (or the number of paragraphs). Perhaps you want an ad after the free three paragraphs, this can do that. It is all automatically set, there are no shortcodes you have to mess with. It is also very easy to exclude specific pages and post if perhaps you don’t want an ad to show up. AdRotate is one of the oldest and most popular choices when it comes to choosing a WordPress advertising plugin. It has a whopping 50,000+ active installs with a 4.3 out of 5-star rating, and has been around since early-mid 2014. AdRotate is a nifty advertising manager plugin with pretty much all the bells and whistles. Easy management allows you to edit your ad display right from your dashboard. You can add, configure, delete, and preview multiple banners in a jiffy. You can set ads to display only to visitors accessing your site from a certain location. There is also a free and premium version of the plugin. You can schedule each ad to expire after a specified period of time or after a certain number of impressions or clicks. You can also choose to be notified by the plugin when an advert is about to be expired, either by e-mail or (and this is where it gets really cool!) or a push notification on your iOS/Android device about ads close to expiration. If you sell advertising space on your blog, advertisers can even e-mail you directly from their dashboard. AdRotate offers extensive ad tracking — it’s easy to see which ads are performing best and which ones are doing poorly at a glance. CTR (click-through rate), daily/monthly stats, and more are also visible and everything can be exported in CSVs. One of its most unique features is the ability to detect when a visitor has an ad blocker enabled and then display a small message accordingly (e.g. “You have an ad blocker enabled — to get the most out of this website, we suggest you turn it off.”). 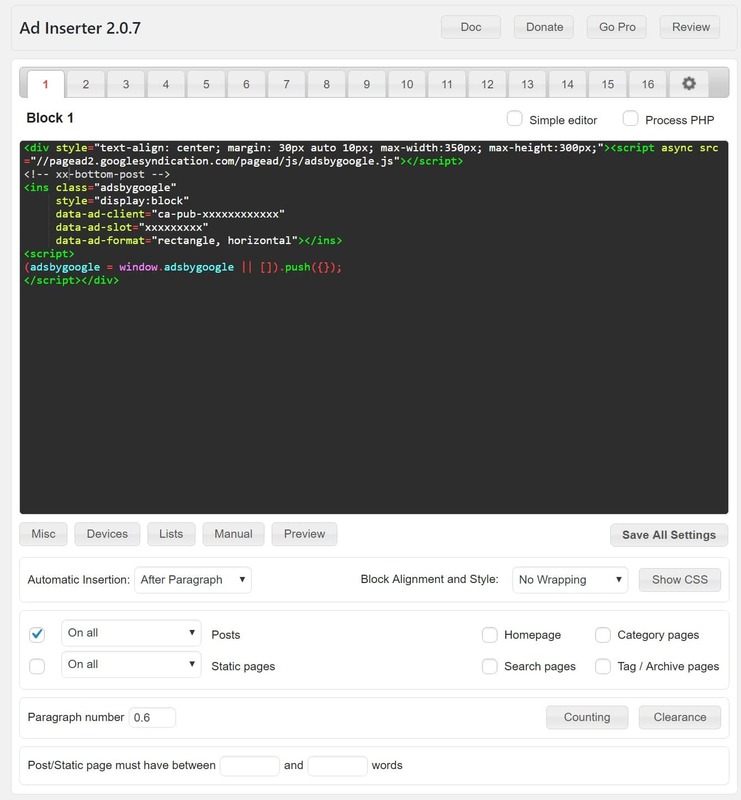 Ads can also be displayed through shortcodes, widgets, or your theme’s PHP. The AdSense Plugin WP Quads is a fork of the discontinued Quick AdSense ads plugin which used to be the most downloaded advertising plugin on the repository. It’s rewritten from scratch with a solid code base and supported by the same team that makes the MashShare social media sharing plugin. It currently has 20,000+ active installs with a 4.9 out of 5-star rating. Display up to a maximum of 10 Ads on a page. Advanced Ads is a simple ad manager made by a publisher for publishers. Based on the developer’s experience delivering millions of ads per month he built this advertising plugin as a powerful, but lightweight solution to not only manage and insert banners in WordPress but to test and optimize them as well. It currently has 50,000+ active installs with a 4.9 out of 5-star rating. The Ads Pro plugin is a premium plugin available on Codecanyon which helps you manage, sell and display your advertising space. If you are familiar with BuySellAds marketplace, this allows you to set up your own BSA on your site and skip the 3rd party. It really is pretty awesome! It has had over 2,400 sales with a 4.4 out of 5-star rating. If you are looking for a WordPress advertising plugin that lets you manage your own ad sales and clients, this is a must-have plugin! The WP-Insert plugin is another WordPress advertising plugin that lets you manage your ads and is optimized for Google AdSense. It is created by the team over at SmartLogix Technologies. It currently has 30,000+ active installs with a 4.5 out of 5-star rating. Marketed as “the ultimate WordPress plugin”, WP-Insert has a lot to live up to. Consequently, it has a lot going for it. Just like the plugin’s tagline says, WP-Insert does a lot more than just placing your ads hither and thither. It can also manage Google Analytics (or any other third party) tracking codes, display legal notices, and highlight code in your theme editor. For the sake of this post, however, we’ll just focus on the function most relevant to us: ad management. WP-Insert supports usage with multiple ad networks. Meaning, you can run multiple advertising networks (like Yahoo!, AdBrite, AdSense, Chitika, and others) concurrently without breaching the terms and conditions of any network. Ads from up to three different networks can be displayed simultaneously. The plugin offers a mind-boggling 20 ad widgets to customize your arrangement. You can configure and schedule each one widget. Furthermore, you can even insert ad code right into your theme code (bloggers can still control the plugin from the dashboard). In-post ads are also an option; display them above, below, in the middle, or on the left/right sides of the content. Banners are displayed with the help of shortcodes. Most impressive is the set of rules that control when, where, and how the ad is displayed. You can even geo-target ads: show a USA-based visitor AdSense ads, and show a Germany-based visitor AdBrite, or however, you want to do it. All in all, a spectacular plugin that offers numerous solutions in one go. As you can see there are a lot of great solutions to make advertisement management easier in WordPress. And in fact, a lot of the plugins above are completely free. And you can extend them with additional premium features such as Google AMP support and geo-targeting. So you should have no excuses to start testing better ad placements, A/B testing, and optimizing ads for mobile. Do you have a favorite WordPress advertising plugin that we missed? If so, let us know below in the comments.